PARIS (International Rail Journal, David Briginshaw) — ALSTOM has acquired an additional 25% stake in the Kazakh EKZ joint venture locomotive manufacturer from Kazakhstan Railways (KTZ) to become the main shareholder with a 50% holding. The deal means that KTZ will reduce its stake in Kazakh EKZ to 25% matching that of Transmashholding, and Alstom will gain a second seat on the Kazakh EKZ board of directors. KZ4AT passenger locomotives produced by Kazakh EKZ. Alstom has also agreed to allow Kazakh EKZ to produce electric locomotive transformers at its factory in Astana and to become a supplier of such components to Alstom. Production will start later this year with the objective of producing 200 transformers annually. As a result of these deals, Alstom will help to develop the Astana factory to enhance the export potential of its locomotives, starting with neighbouring countries such as Azerbaijan and Uzbekistan. Kazakh EKZ, with assistance from Alstom plants in France, is supplying electric locomotives to KTZ under a contract which runs up to 2020, and has so far delivered 31 KZ8A freight locomotives and six KZ4AT passenger locomotives. 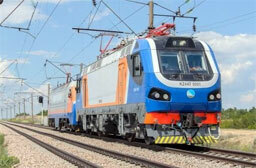 Alstom and Kazakh EKZ won an order in 2015 for 50 locomotives for Azerbaijan Railways.